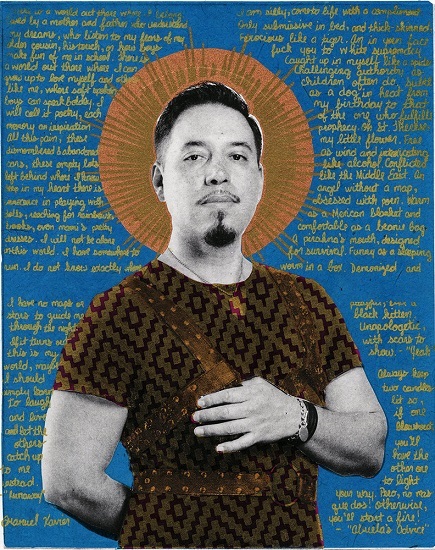 “Queer Icons” by Mexican American queer artist Gabriel García Román reveal the holiness of LGBTQ people of color in much the same way that traditional icons open a window to heaven. “I’d like to think of them as a hybrid between saints and warriors," Roman said in a recent interview with Mic.com. "Saints are usually depicted as martyrs, noble and selfless individuals working for the betterment of the world, but also I wanted to portray them as fearless warriors. They are looking right at you and challenging you." His subjects are activists and artists who help the community -- presented with haloes, gold accents and vibrant colors and patterns. 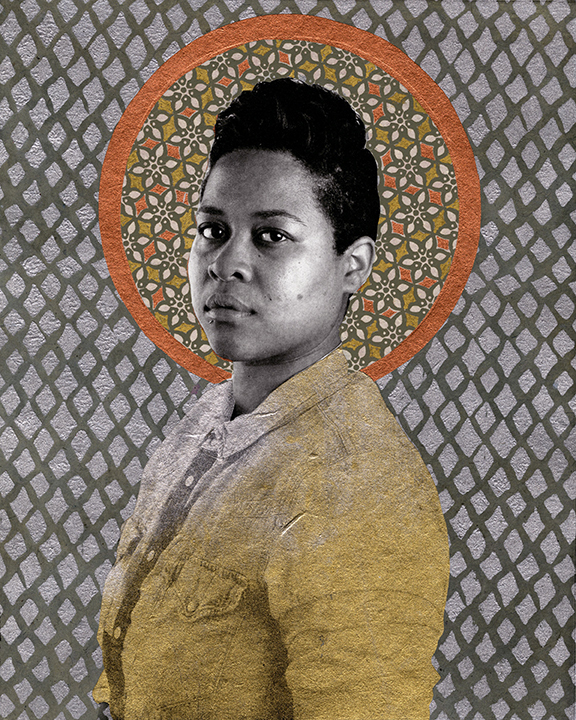 The queer icons give power to the disempowered, visibility to the invisible. Like traditional icons, they gaze directly into the eyes of viewers, daring them to see what is sacred. But these are also living, breathing icons who populate contemporary America in its diversity. All are queer people of color, including Latina/o, black, Asian and mixed heritage. Some are immigrants -- naturalized, documented or undocumented. They come from many different places on the gender spectrum. Traditional Catholic icons were Roman’s first introduction to art when he was growing up. 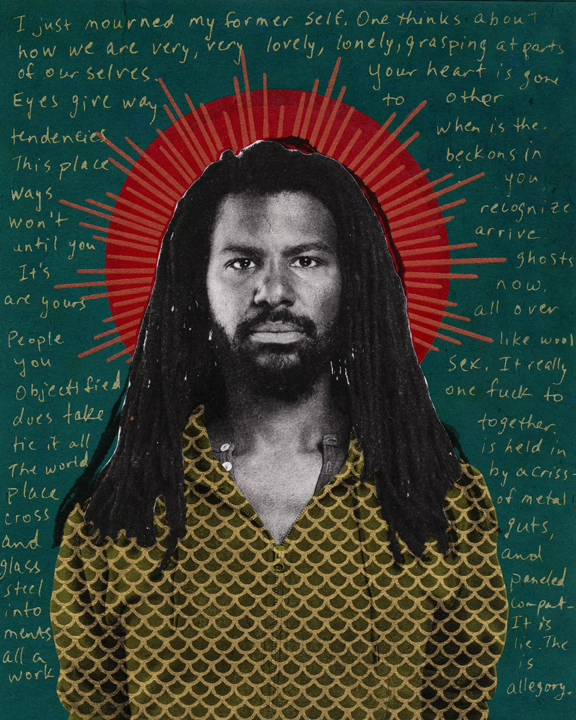 He was especially fascinated by the haloes on the saints who graced the walls of his neighborhood church. 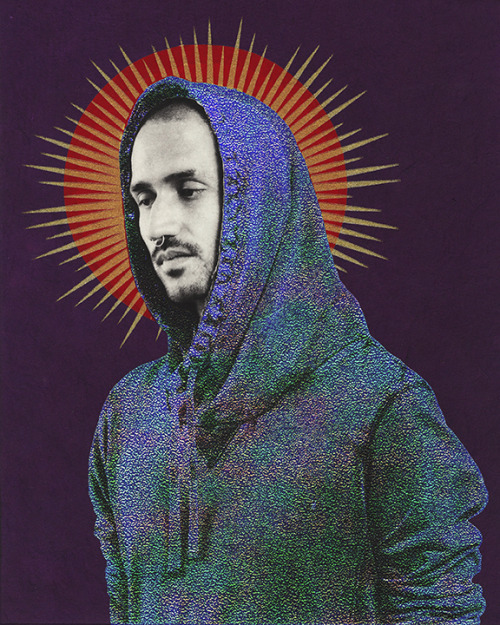 Born in Zacatecas, Mexico, Roman was raised Catholic in Chicago and currently lives in New York City. The Mic.com interview was part of an explosion of Internet attention sparked by his participation in “Manifest Justice,” a major group exhibit in Los Angeles in May. 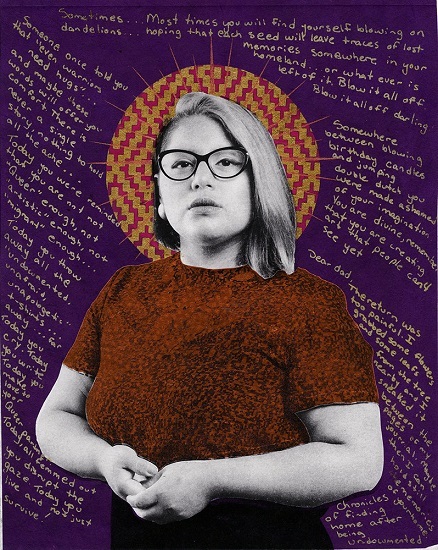 Roman’s images displayed there included “Mitchyll,” whose hooded sweatshirt echoes the hoods of medieval monks -- and the famous hoodie worn by Trayvon Martin, the unarmed African American teen whose 2012 murder led to massive national protests against racism. Roman begins the process of creating a Queer Icon by photographing the person. 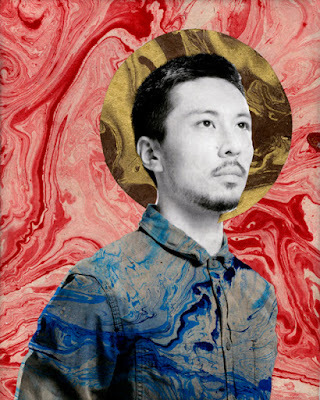 He uses a chine-collé method of silkscreen printing to put layers of colors, patterns and text over each portrait. For example, poet Julissa Rodriguez begins, “She used to believe in miracles.” Rodriguez lives in the Bronx, NY, and her family is from the Dominican Republic. “Today you were reminded that you are not ‘queer’ enough, not ‘artistic’ enough, not ‘migrant’ enough,” writes Sonia Guiñansaca, a poet and community organizer who was born in Ecuador, raised in Harlem, NY. She is open about her undocumented status. “I just mourned my former self. One thinks about how we are very, very lovely, lonely, grasping at parts of ourselves,” begins Bakar Wilson, a poet who teaches English at Borough of Manhattan Community College. Roman gives credit to a variety of artistic sources for inspiring his Queer Icons, including Renaissance, Flemish and Christian Orthodox portraiture traditions. 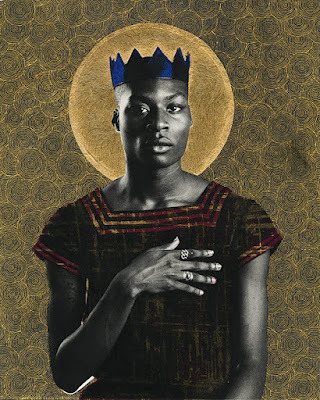 More contemporary influences include portrait artists such as African American painter Kehinde Wiley, Armenian Canadian photographer Yousef Karsh, and South African photographers Zanele Muholi and Pieter Hugo. Queer people of color are under-represented in art overall and religious art in particular. Roman’s “Queer Icons’ have similarities with other queer art projects, including the “Saints” series of Tony O’Connell, who captures holy moments in everyday life; the Queer Clergy Trading Cards of Chris Davies, who gives visibility to ordained queer ministers; and Ria Brodell’s “Butch Heroes” series, which puts historical queer women into the format of Catholic holy cards. 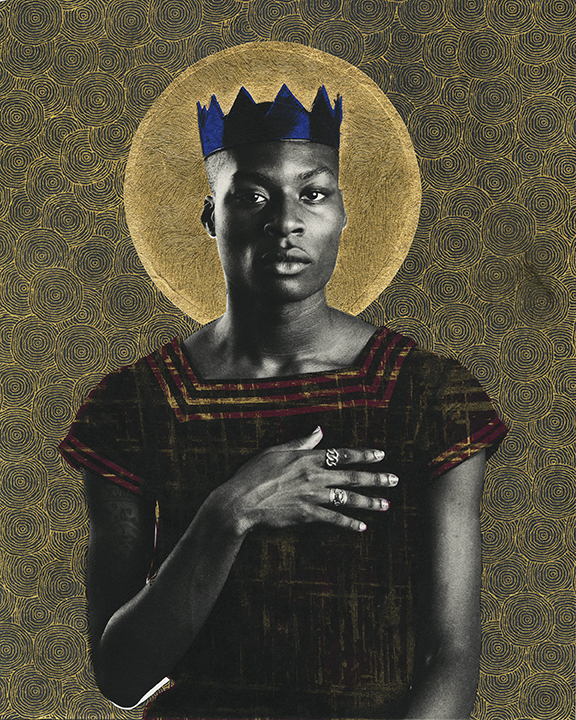 But Roman may be the first to focus exclusively on queer people of color with Christian iconography. Roman’s Queer Icons also stand in the tradition of Pop Art master Andy Warhol, another queer silkscreen artist whose portrait style was influenced by the Catholic icons that he saw while growing up in an immigrant family. 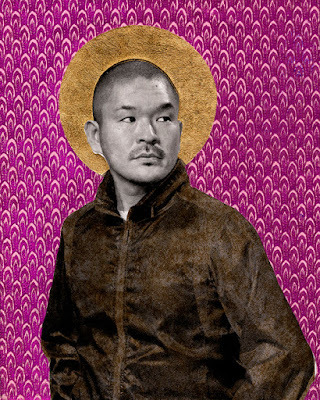 (In Warhol’s case, it was Byzantine Catholic.) Warhol took the iconic style beyond the church to create colorful silkscreens of pop-culture icons such as Marilyn Monroe. Roman further democratizes the process by making icons out of people who rarely get any attention in either secular or sacred contexts. A variety of galleries on both coasts have exhibited Roman’s art. 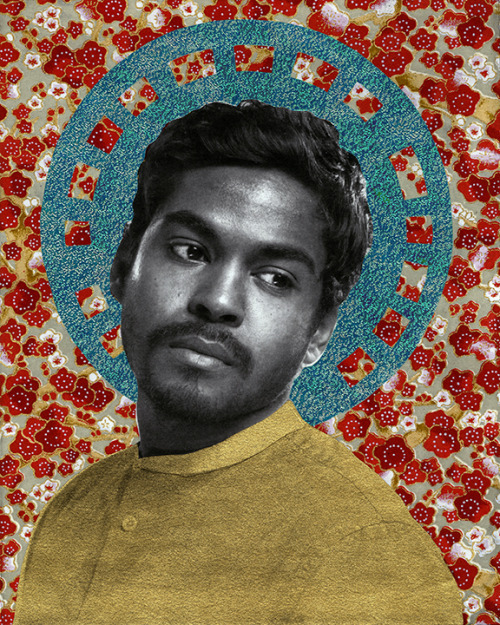 He has completed more than 30 images in his ongoing “Queer Icons” series. They are posted on his website gabrielgarciaroman.com. A selection is posted here to inform readers and inspire those who wish to meditate on the unlikely people who embody embody God’s spirit today. 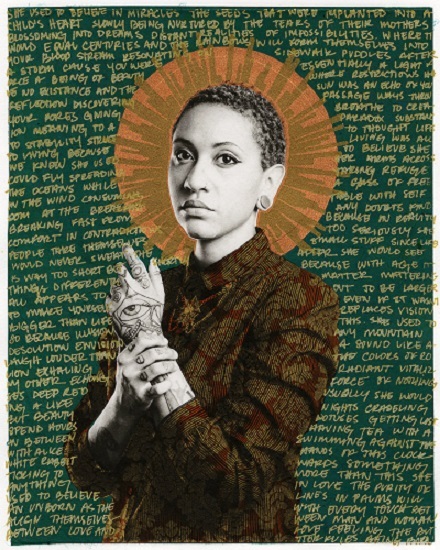 Credit: All images are from the series “Queer Icons” by Gabriel Garcia Roman, 2011-2015, Photogravure w/ Chine-Colle and silkscreen, 11x14, image size 8x10. 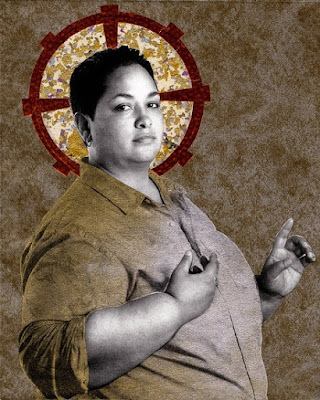 Special thanks to the many people who sent me news tips urging me to write this article, including Terry Weldon of Queering the Church, Ann Fontaine of Episcopal Cafe, Chris Davies of Queer Clergy Trading Cards, Jane Redmont and Scott Sella. I understand where the artist is coming from, but these are not religious icons - they might be described as memorials. Iconography is religious art that is intended to take the observer through the picture into the mystery of God. All I see are photographs of people with some nice graphics as background. Poem: "Faggots We May Be"